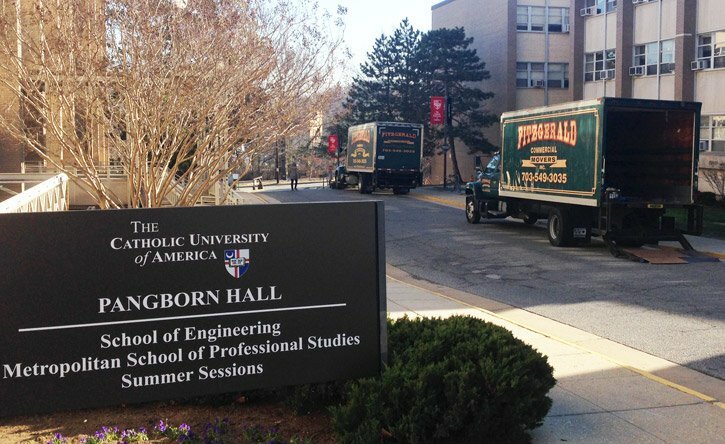 The idea of moving items from university or college buildings can be hugely overwhelming. Whether you're moving items from staff buildings, seminar or lecture theatres, libraries, student dorms or entire campuses, we can help simplify the moving process and make the relocation easier on everyone involved. With over 35 years' experience in the moving industry, you can trust our reliable team to treat your university's equipment and furniture with the care and respect they deserve, ensuring everything arrives safely at your new location. The Washington metropolitan area is widely known as one of the most educated locations in the United States, and there are many universities and colleges within the area and nearby, including the American University, Georgetown, the Catholic University of America, George Washington University and the University of the District of Columbia. If you're looking to make a move from your university or college within or away from the Washington DC metro, contact Fitzgerald Moving & Storage! We will navigate the busy streets with great efficiency, pack, move, store, assemble and disassemble items, and ensure everything is taken care of for you; it's the easiest way to conduct any university or college move. When it comes to the relocation of colleges and universities, Fitzgerald Moving & Storage can be trusted to make your move a success. Our staff is experienced in safely transporting even the most unusual items, from university lab equipment to sports equipment and musical instruments. With our custom moving plans, we plan every part of your move to the greatest efficiency, and tailor our services to meet your needs and schedule. With our trustworthy team members and history of successful moves, Fitzgerald Moving & Storage is the best choice for any university or college looking to relocate. Contact us to receive a free quote, for further guidance on how best to plan your college or university move, or to speak with one of our friendly advisors. We look forward to hearing from you!